The mass suicide and murder of more than 900 people that occurred on November 18, 1978, in Jonestown, Guyana is still the largest in history. Their deaths and the murder of Congressmen Leo Ryan are regrettable moments in what could have been a movement that changed the way people view society. Jim Jones had high hopes for his People’s Temple and their mission to reform social conditions and give way to freedom, equality and happiness. Jones himself died of a gunshot wound to the head and did not drink the poisonous concoction. Prior to Jones’ final meltdown, several members of the People’s Temple had expressed desire to leave the organization disillusioned with promises of grandeur. The reality that Jonestown was a nearly impossible task began to set in causing many to question their decision to leave the United States. As a result of the final action by the maniacal Jones, families were permanently separated and several generations died at the same time. Those who were lucky enough to escape that day or beforehand were spared the agonizing final moments of the People’s Temple. Deborah Layton, her brother Larry and mother had joined the People’s Temple attracted to Jones’ rhetoric and vision for the church. She becomes a personal secretary of Jones and in the process becomes one of many victims of Jones’ inappropriate conduct. Following Jones to Guyana, they quickly become absorbed into the alternate reality that became the backbone of the commune’s existence. As time progresses, she becomes dissatisfied with what is clearly a dictatorship run by Jones. Leaving her brother and mother behind, she makes her escape from the People’s Temple and this is her story of why and how she made the decision to leave behind the people that she loved the most to save herself from a fate destined to nearly 1,000 people, many of whom she knew on a first name basis. Larry had served as one of the gunmen who fired upon Congressman Ryan’s plane, killing him and several news reporters in the process. He was the only person convicted for the massacre and was subsequently convicted and incarcerated. He served 18 years in prison before he was paroled in 2002. He lives a quiet life Northern California and to my knowledge, has not made any public statements regarding the tragedy at Jonestown. Among those wounded was a young reporter named Tim Reiterman who later wrote the definitive account of Jones’ reign of terror. The book was published under the title Raven: The Untold Story of Jim Jones and His People. More than thirty years have passed since the Jonestown tragedy. Layton has her own Twitter page devoted to her career as an author and a survivor of Jonestown. She carries with her the memories of her time with Jones compounded with the conviction of her brother and the loss of her mother. 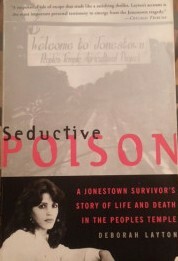 Her story is tragic and bittersweet but key to understanding why Jones and his words were seductive poison. Posted on August 28, 2015, in Biographies and tagged Jim Jones, People's Temple. Bookmark the permalink. 1 Comment.